Coatex Medicated Shampoo for dogs is recommended for use for common skin conditions, such as poor coat condition and flaky or greasy skin. Coatex provides an anti-bacterial and anti-fungal action which is ideal for removing scales and crusts.It can be used weekly with no side effects as a superb grooming shampoo. Shake the bottle well before use. Wet your dog's skin with lukewarm water. 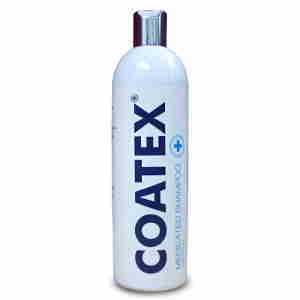 Add small amounts of Coatex to fur, gently massaging it in until generously lathered. Leave in for 5 minutes, rise thoroughly and repeat procedure once. Thoroughly rinse off your pet, making sure to rinse around the ears and belly. Dry properly, have several warm dry towels ready to dry off your pet. Please consult your vet for advice on the use of this product. Ingredients:Chloroxylenol, salicylic acid and sodium thiosulphate . Recommended by our vet and we use it every other day on his paws/under belly post walkies & v muddy walks plus for full wash as needed. We have two westies, one suffers from very severe skin problems; this shampoo is really good at helping to control the itching and crusty skin areas.